All parts of the Arborvitae tree were used extensively by Native Americans for health benefits and for building vessels, totem poles, baskets, and clothing. Antimicrobial is an agent that resists or destroys pathogenic microorganisms. The Invasion and multiplication of pathogenic microorganisms in the body is called an infection. When we are infected by pathogens we become sick, which means that our bodies stop functioning properly. 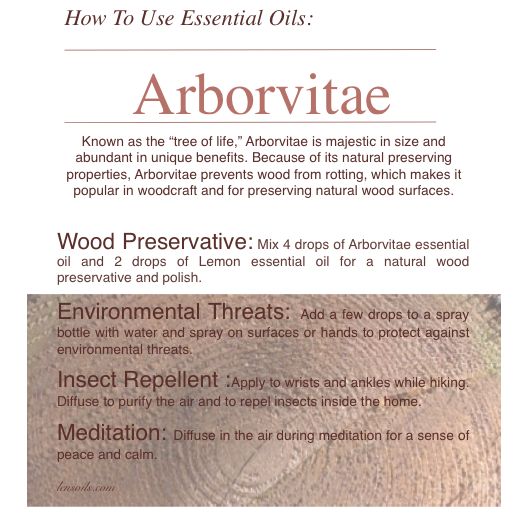 Arborvitae essential oil has a high content of tropolones, a group of chemical compounds that protect against environmental and seasonal threats, have powerful purifying properties, and promote healthy cell function. Cardamom is commonly used to help reduce indigestion and nausea, and to soothe stomach discomfort and promote digestion. Its distinct scent can lessen motion sickness while promoting a positive mood. Frankincense promotes a healthy inflammatory response and acts as an overall tonic to the body’s systems, helping them function optimally. When inhaled or diffused, Frankincense induces feelings of peace, relaxation, satisfaction, and overall wellness. Helichrysum is highly valued and sought after for its many health benefits. It’s frequently consumed to help detoxify the body. Also referred to as Everlasting or Immortal Flower. Inhaling Lavender promotes relaxation and a restful night’s sleep, making it an ideal oil to diffuse at bedtime and when stress levels are high. Lemon has multiple benefits and uses. Lemon is a powerful cleansing agent that purifies the air, disinfects surfaces, and can be used as a non-toxic cleaner throughout the home. 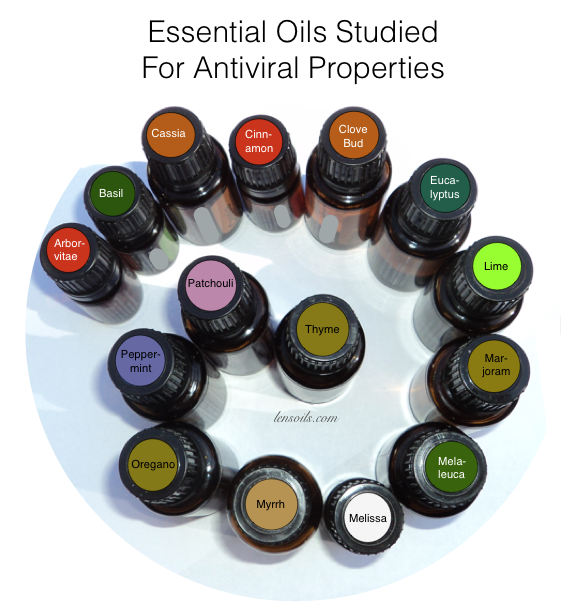 The term antiviral refers to something that is able to inhibit or stop the development or duplication of an infection causing virus. Is unique because it has a high ester content, and 0% thuja content (a toxic constituent found in other varieties of arborvitae). It also has insect repelling properties even decomposition of the fallen trees for centuries. Eucalyptus oil is best known for respiratory health and works great when massaged over the chest and throat. Can be applied without diluting. Helichrysum is highly valued and sought after for its many health benefits. It’s frequently consumed to help detoxify the body. Lemon oil is great for cleaning, can be taken internally, or used topically. Those with sensitive skin may want to dilute it, because it can cause photosensitivity. Lime oil can usually be used without diluting, depending on skin sensitivity. It can be taken internally, but like all citrus oils, it can cause sensitivity to the sun with topical use up to 12 hours prior. Using it before bed is a great option. Melissa is also great for your skin or over the reflex areas of concern. You can also add a drop to your tea. Myrrh is valued as an expectorant, which means it promotes the expulsion of mucus in cases of bronchitis and lung congestion. Myrrh is best for chronic conditions, because it contains tannins and resins. It has an astringent effect on tissues. Peppermint is very pleasing to the taste buds (you can add the oil to tea or water), but is powerfully soothing to the digestive system. You can usually apply it without diluting. inhale for nausea, or take internally as suggested. Thyme is a great defense against many concerns. It should always be diluted (4 drops carrier oil to 1 drop thyme). You can also cook with it.